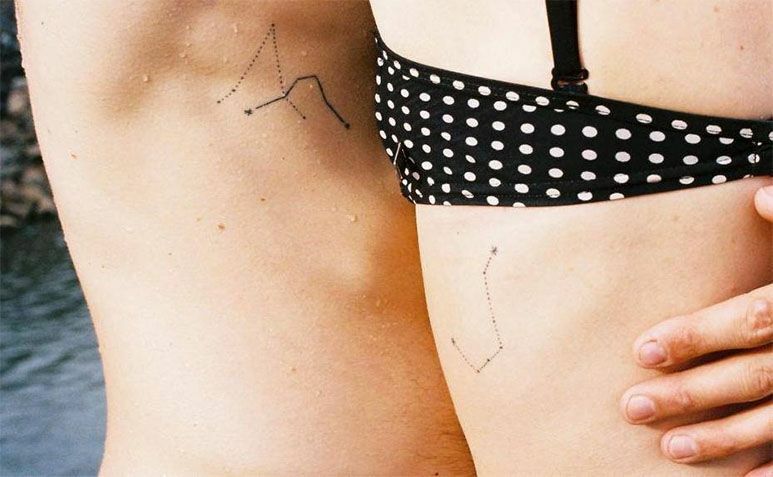 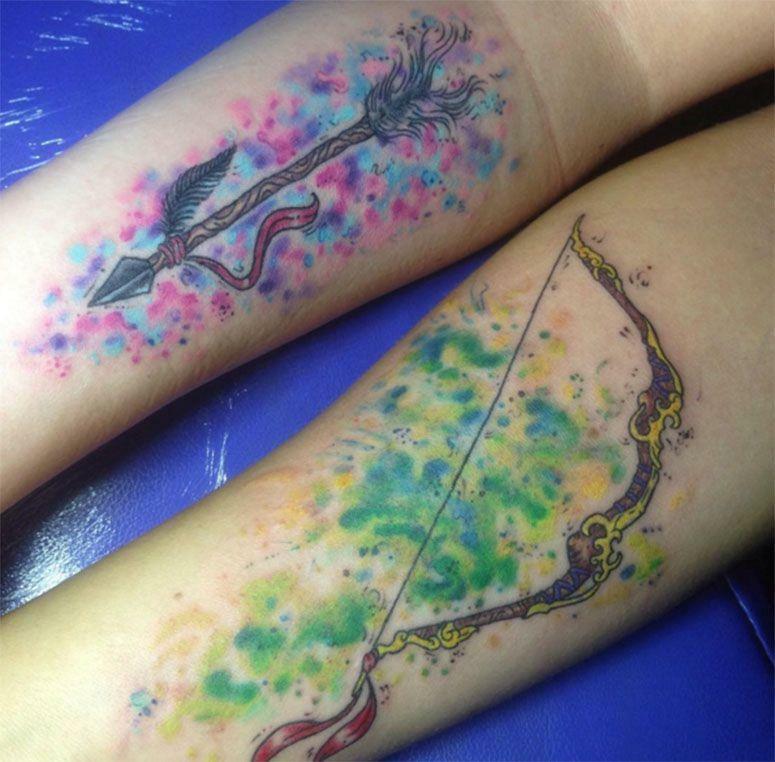 Very used to immortalize moments and score the skin signs of great significance, the tattoo is a good choice for those who want to register permanently a relationship. 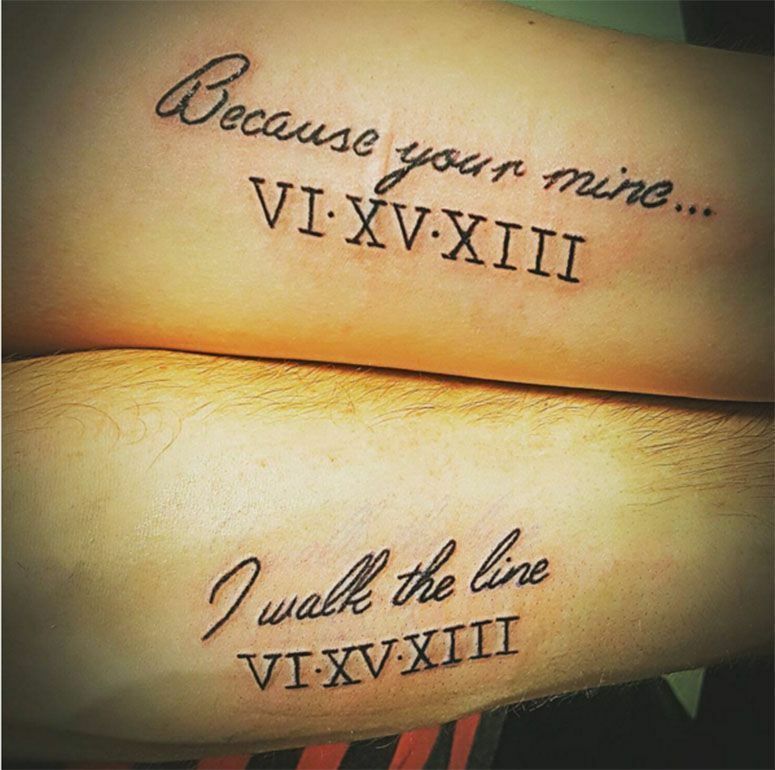 Be as a tribute, a declaration of love or a celebration of any important date, decide to get a tattoo together can create a strong and special bond for the couple. 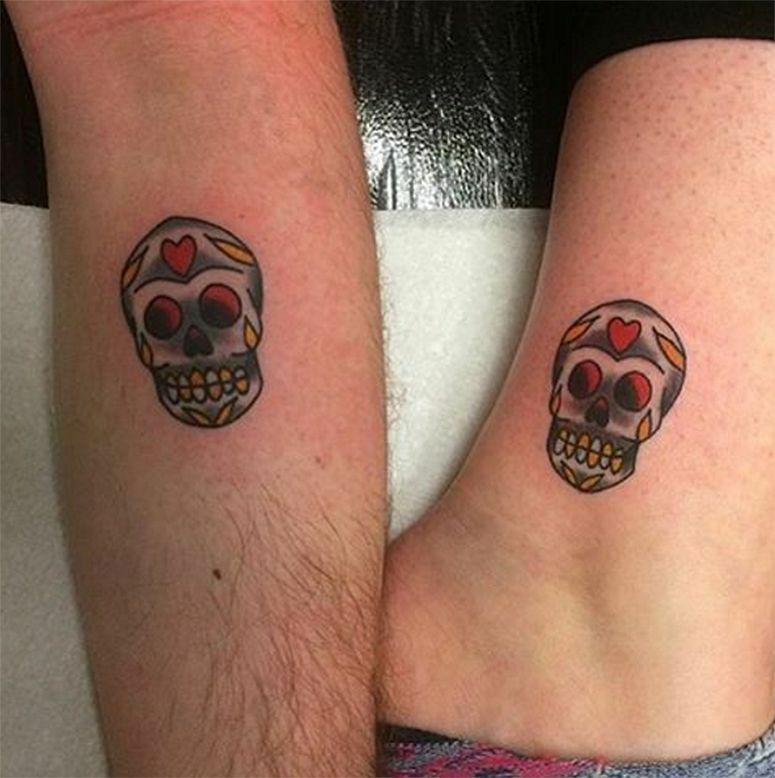 The practice is somewhat controversial - after all, tattoos are permanent; relationships, not always. 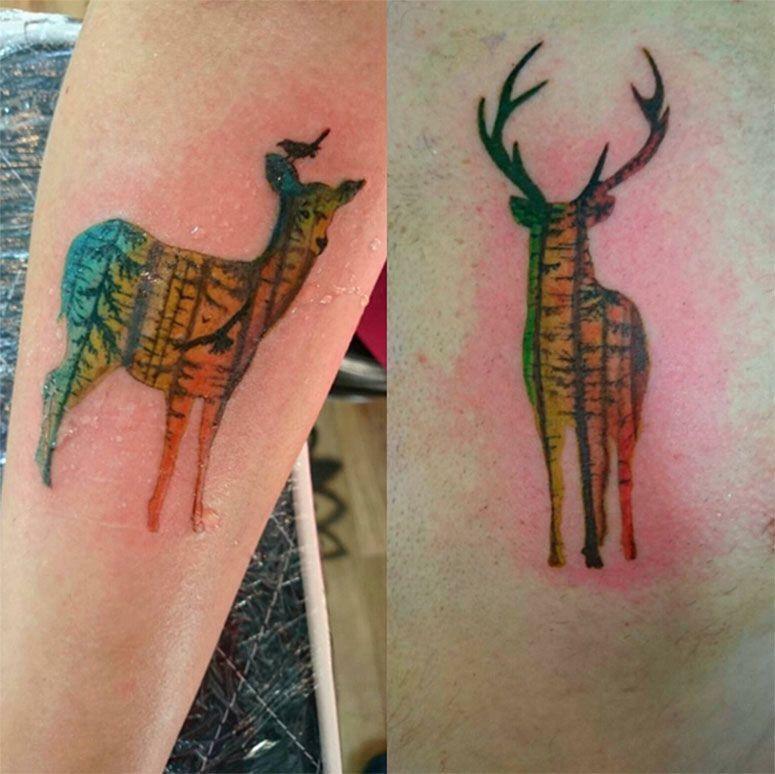 So questions about possible regrets or concerns with the desire to remove or cover the design in the future are common. 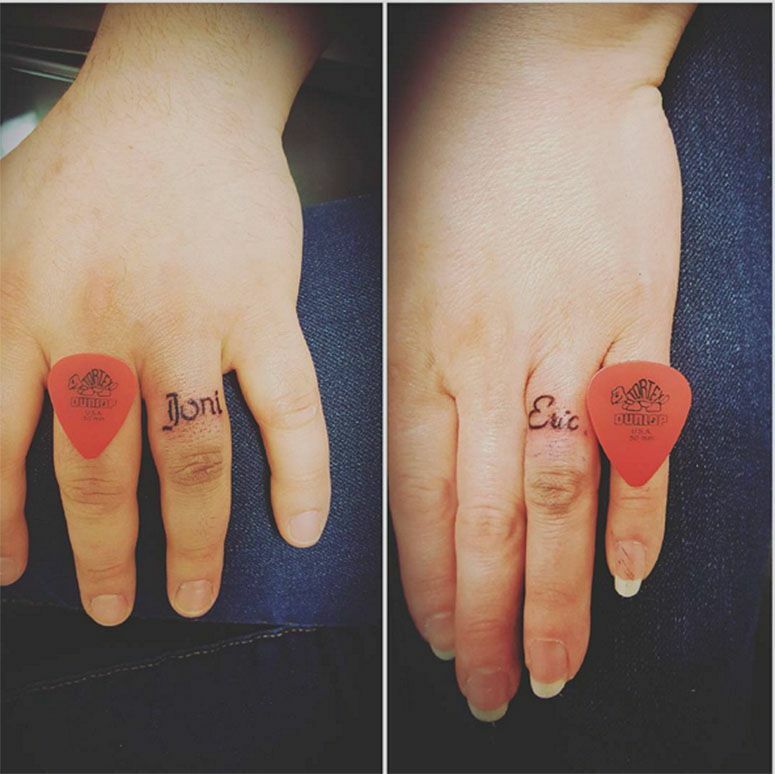 Remember that every choice of tattoo should be well thought out. 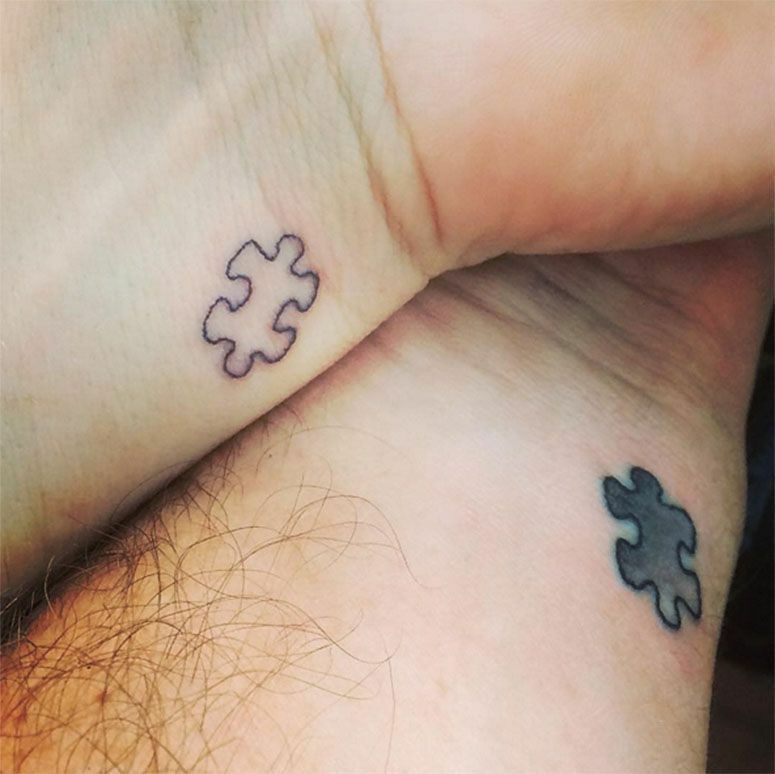 The more well resolved, the less likely regret it later, even with the eventual end of the relationship. 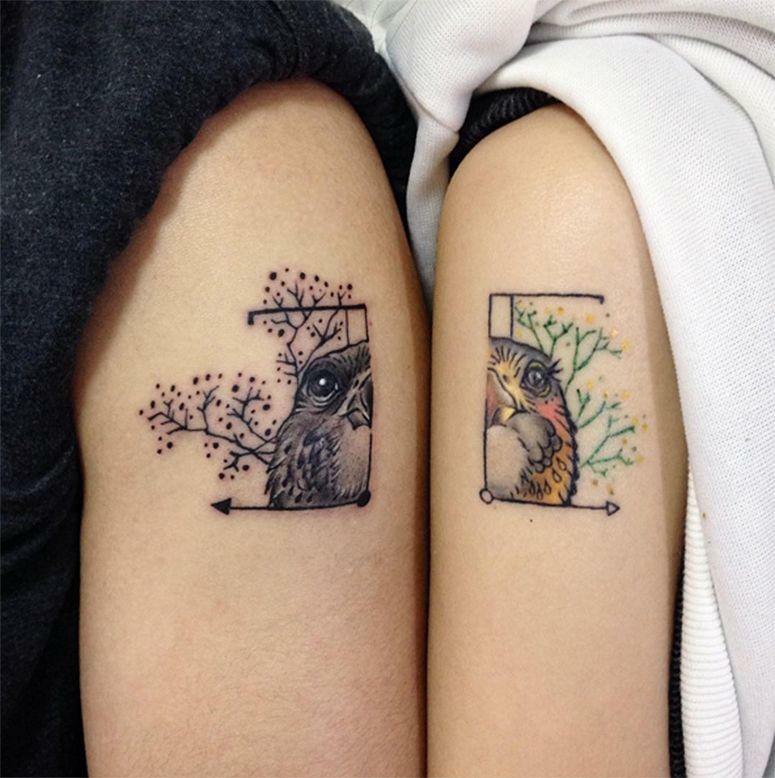 "It is important to consider whether it is a boost if the two actually want to get the tattoo. 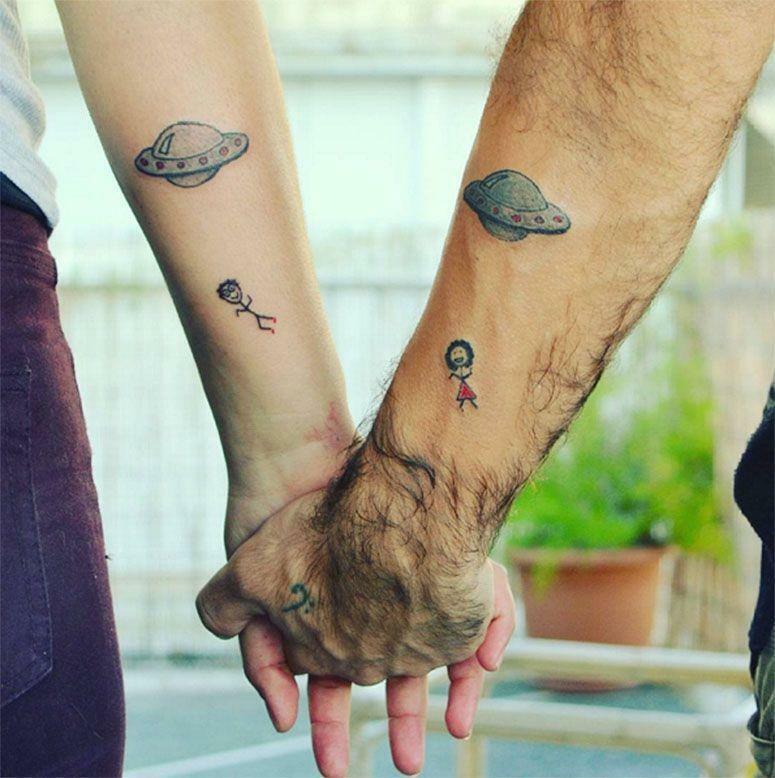 Remember that everything in life is transitory and that the relationship could end. 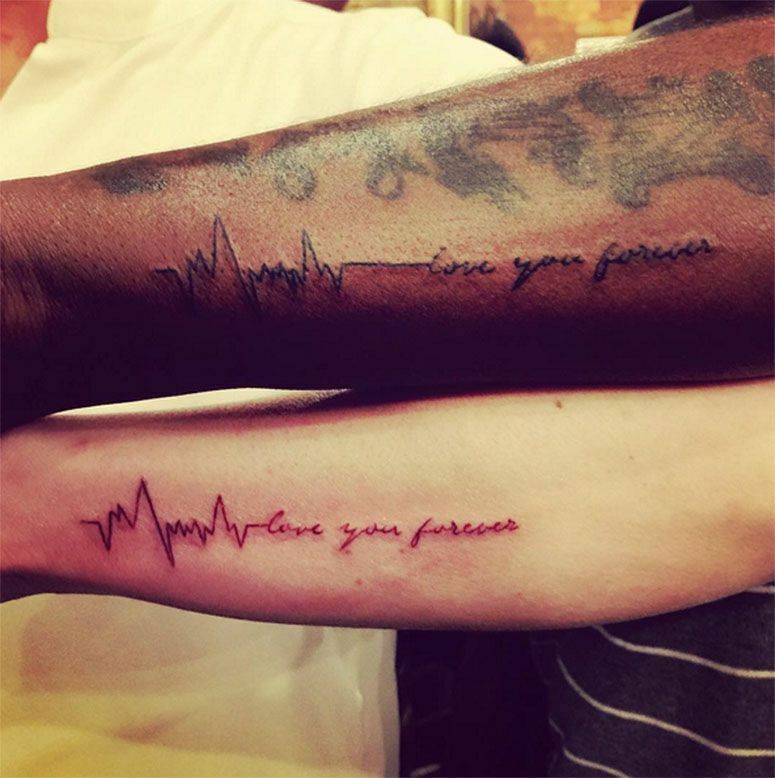 If even then the desire to celebrate that moment is larger, so do the tattoo, "advises Gonta Felix, tattoo artist and owner of Inkheart Tattoo. 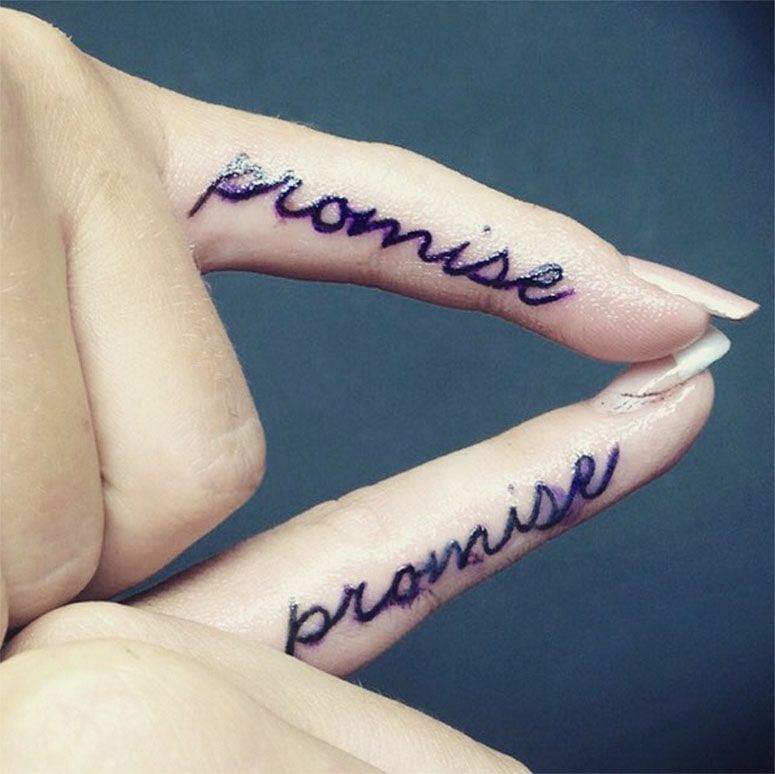 At the time of making the decision, the first step is to make sure to choose a good professional. 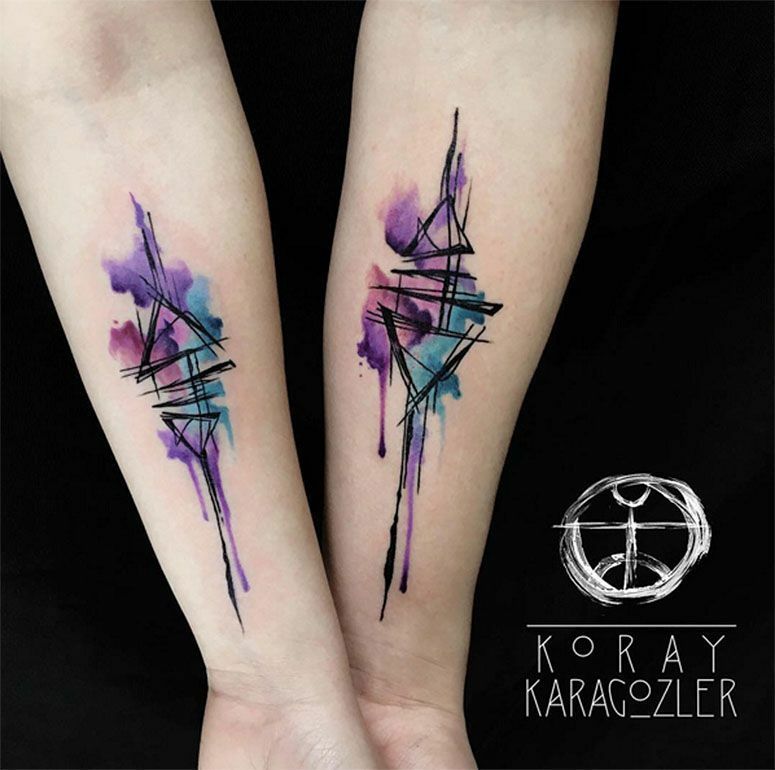 In addition to providing the trace and tattoo artist's style matches the result you want to achieve, it is essential to check that the health and hygiene conditions are suitable. 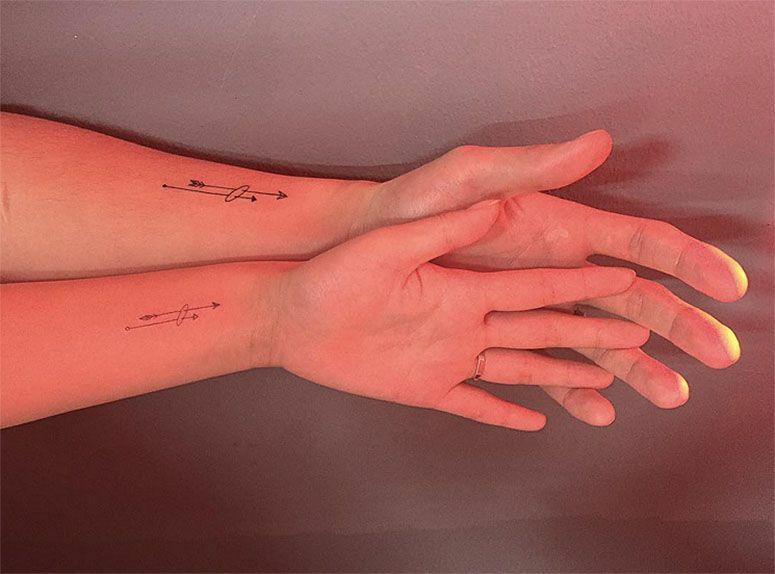 "Regardless of the tattoo be for the couple or not, the main thing is to get a nice place, with good people, using quality material and are concerned with biosafety, the indication is always a great choice when choosing a studio, and, of course, know the studio work before. 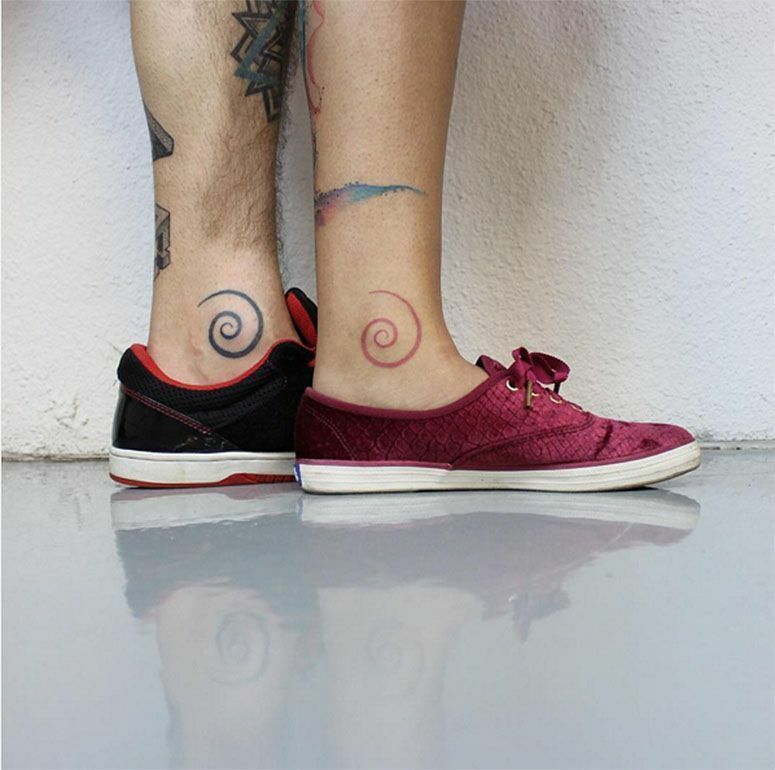 Tattoo is a serious thing and it's forever, "said Gabriel Ferreira, the Kauai Studio dermopigmentador. 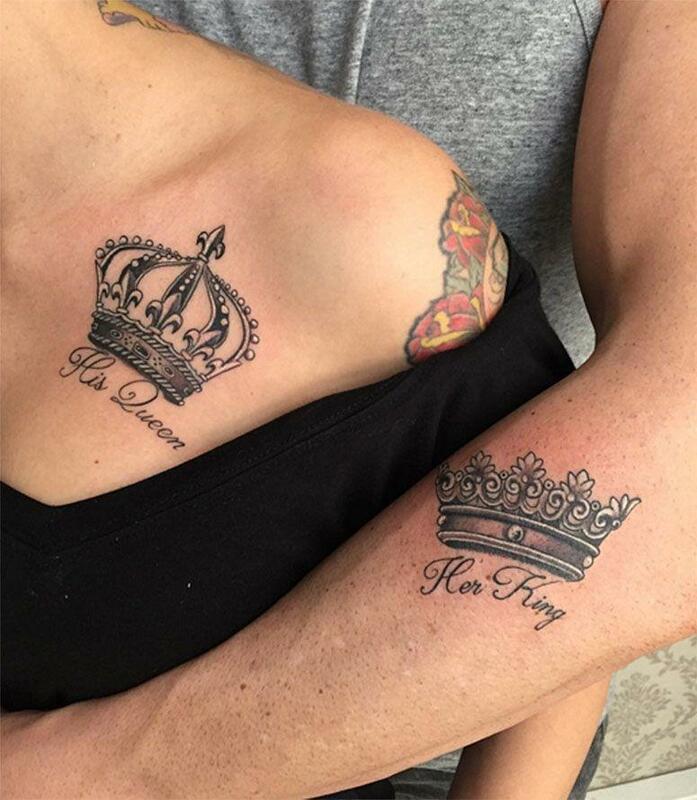 Choose the design is a major challenge for the couple tattoo, because you have to find something that both parties are satisfied. 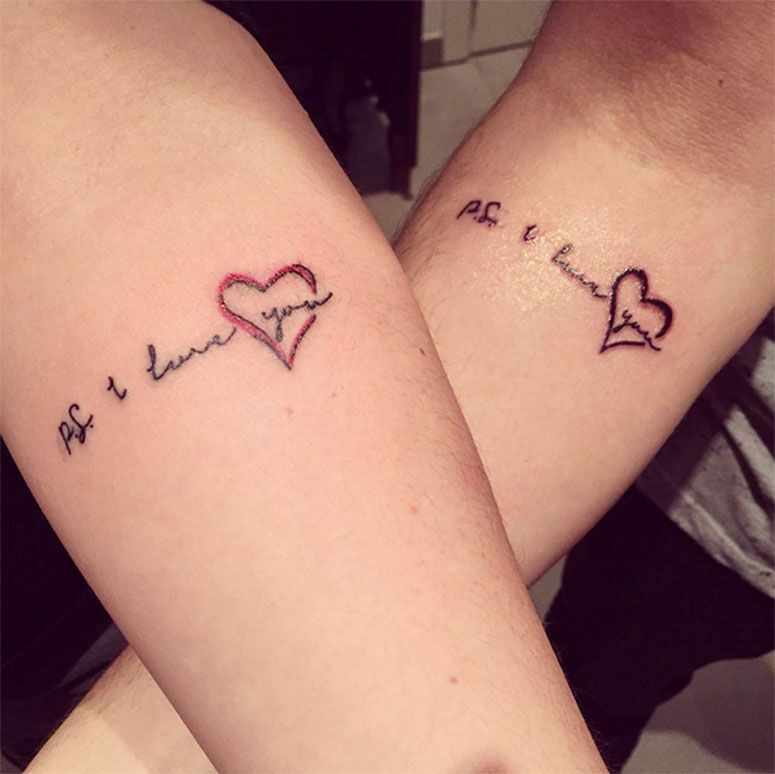 The options are endless and go far beyond the more traditional custom of tattooing the couple's names. 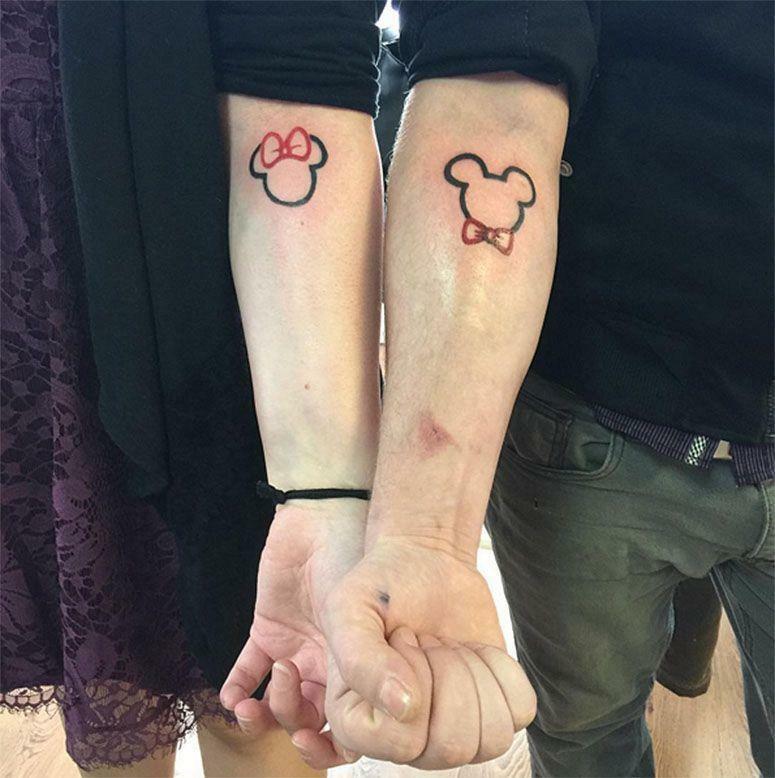 Think of the history of the relationship and in common in tastes is always a good start to find something that has a special meaning for each. 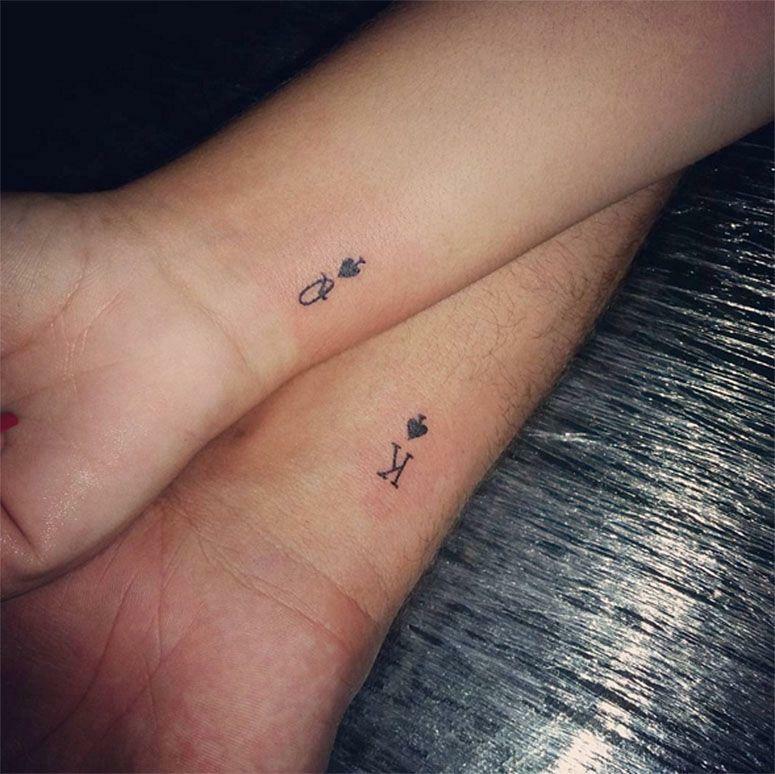 "A couple of tattoo should always symbolize how important you are to each other at that time," says Felix Gonta. 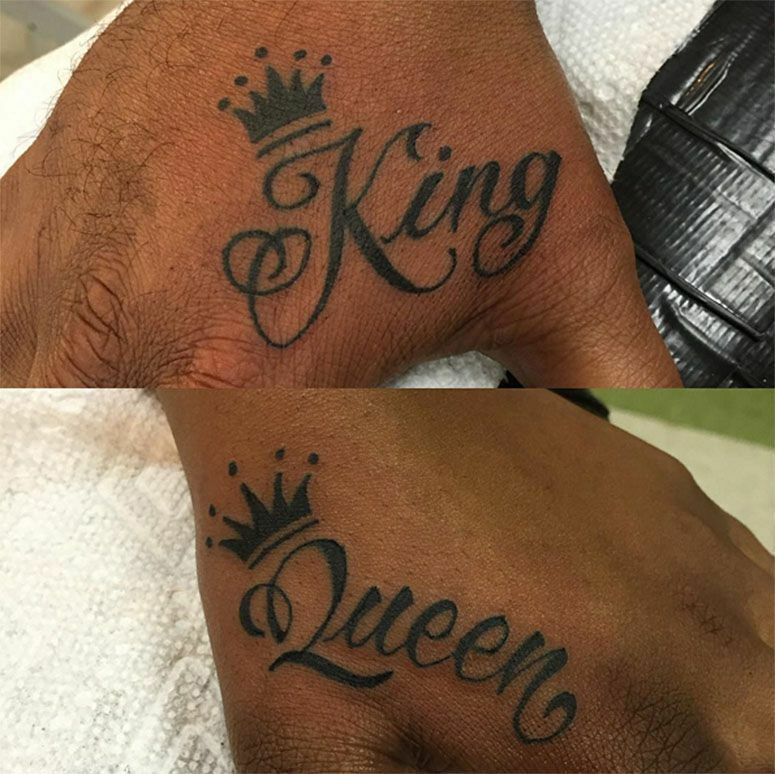 According to Gabriel and Felix Gonta, the most common choices are names, song phrases, common objects or animals to the couple, designs that can complement and equal designs. 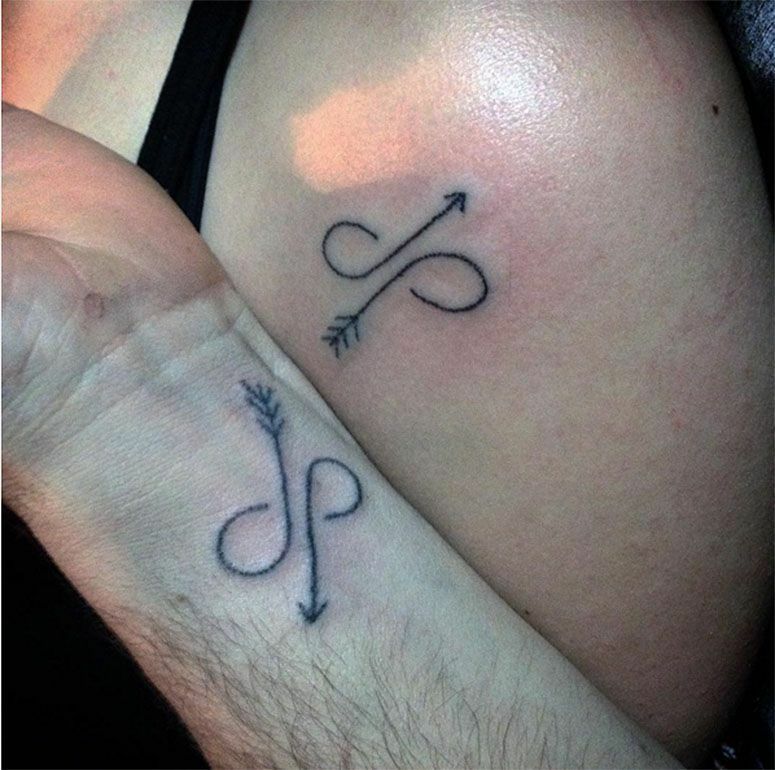 Before hitting the hammer, assess whether the intention is that other people understand and realize the significance of design clearly, or if desired is something more intimate and that makes sense only to the couple - everything will depend on the dynamics and personality double. 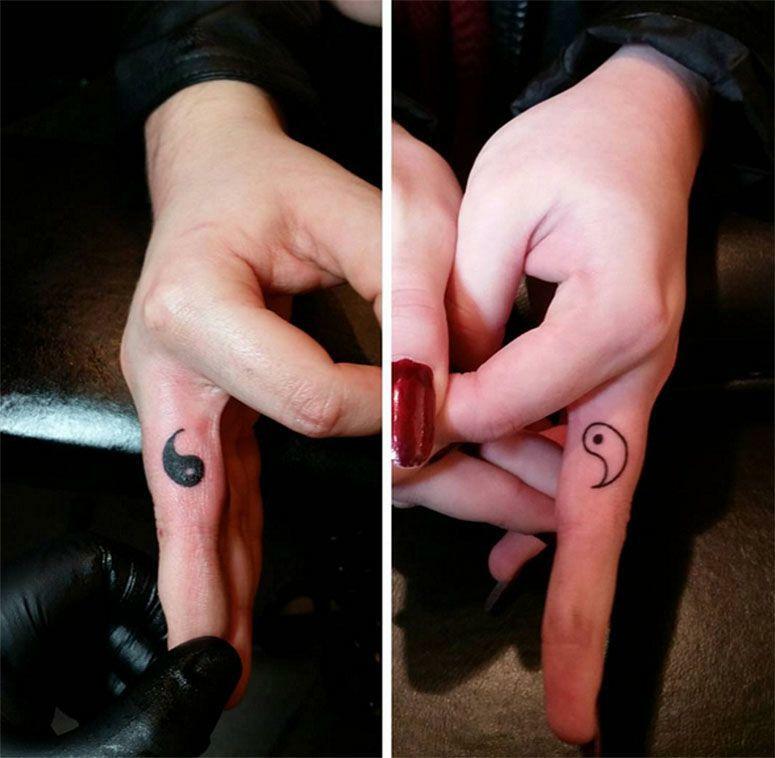 Check out a few tattoos styles for inspiration. 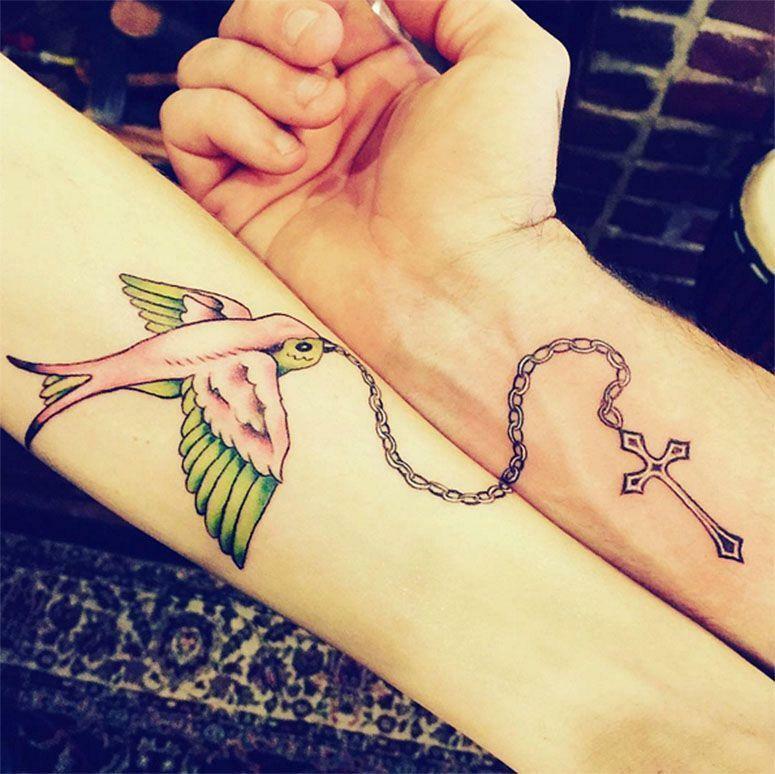 "I think that drawings are completed are very interesting and really cool to do, like a key in a lock and a heart on the other, or halves of a heart on each of the couple," says Gabriel. 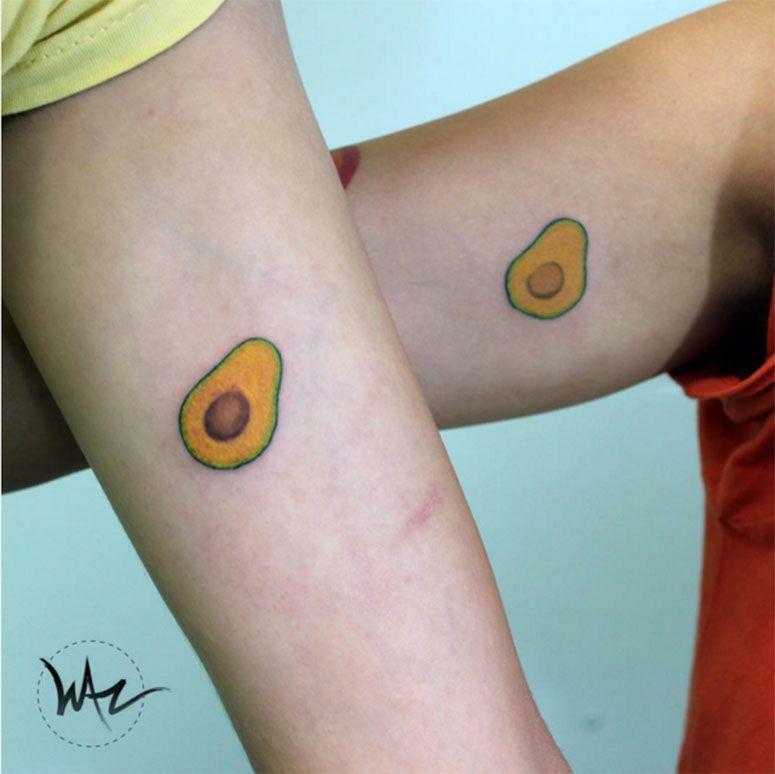 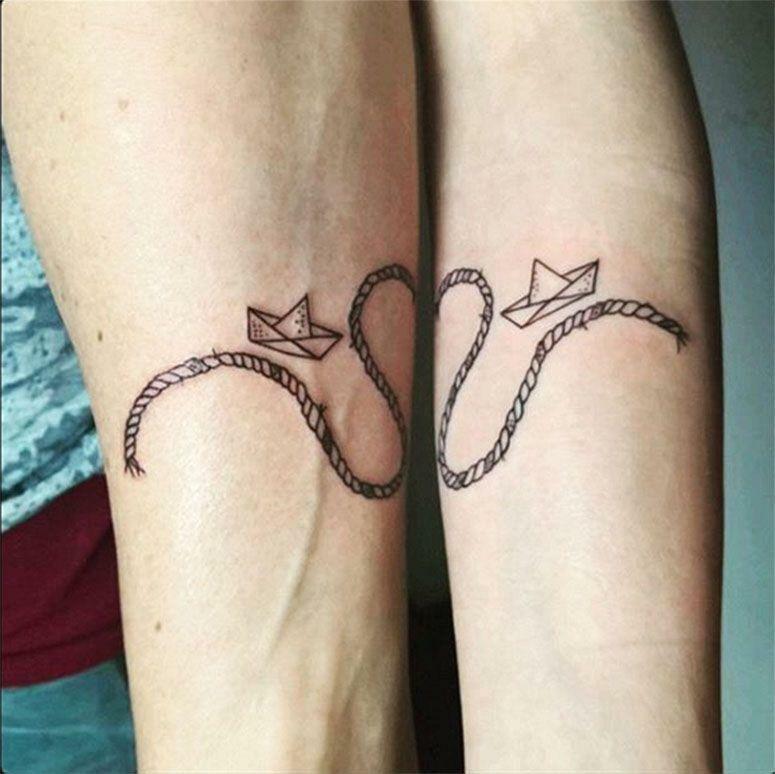 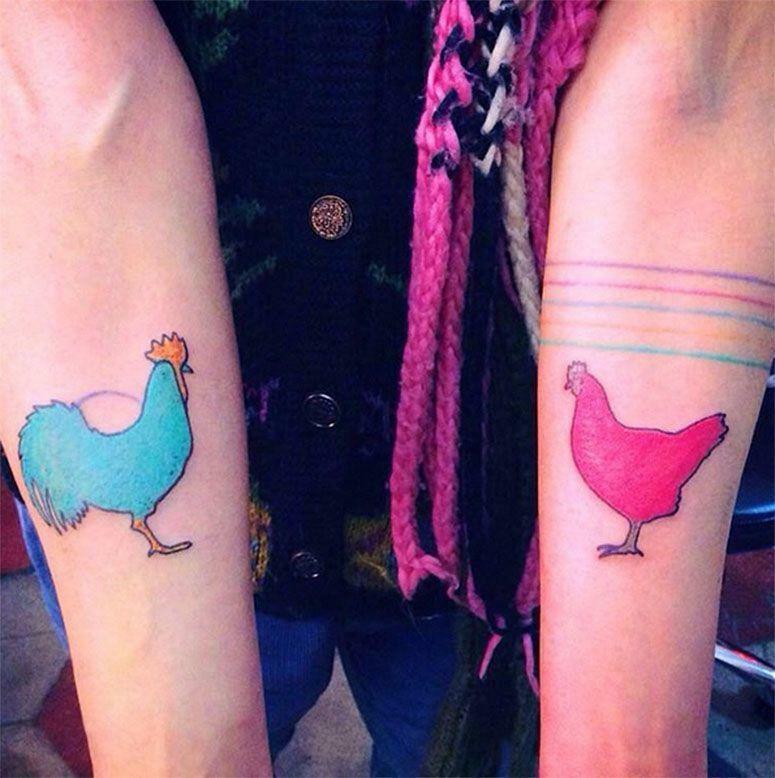 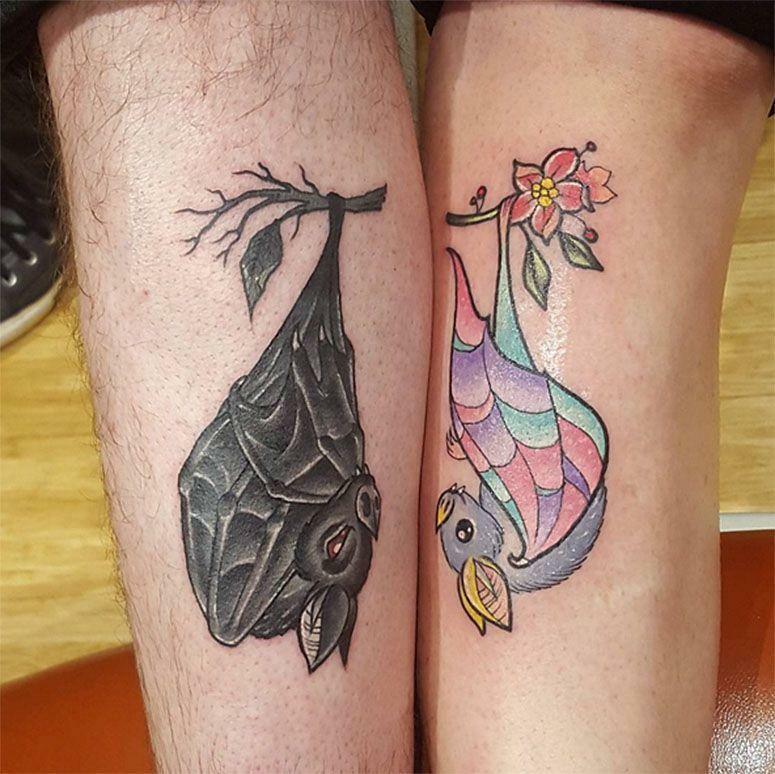 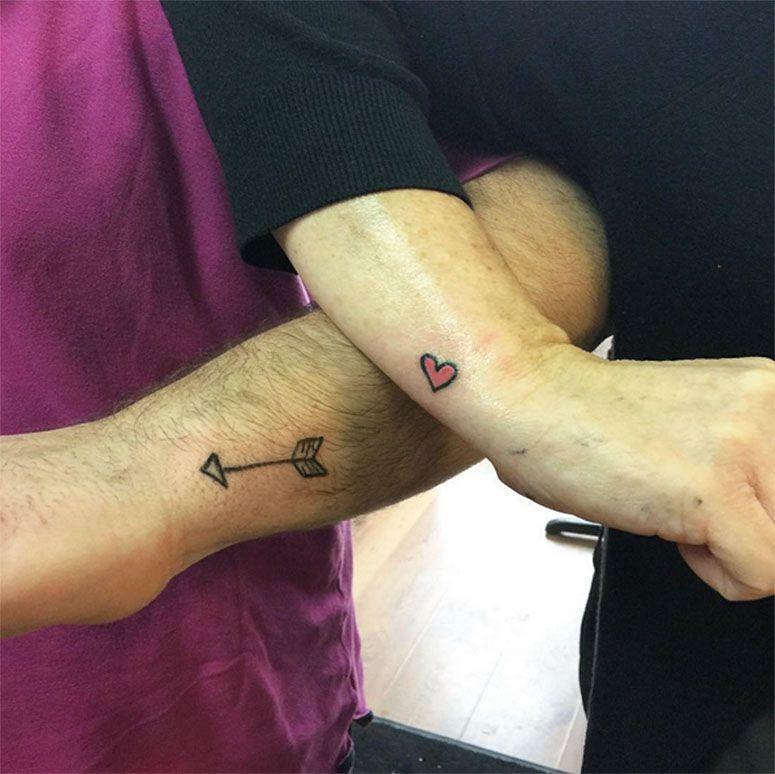 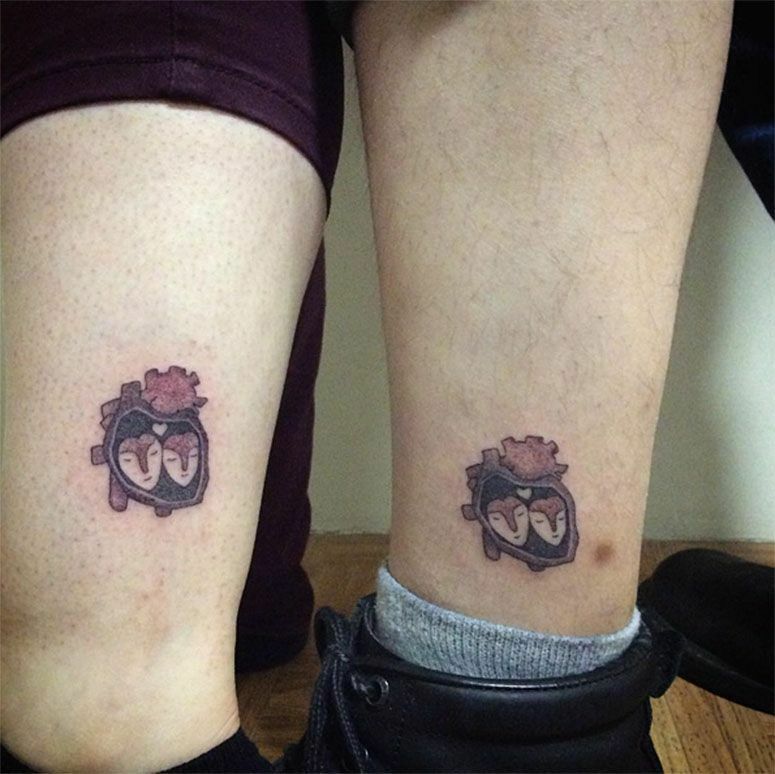 In this style of tattoo, the couple can choose to split a drawing in half so that each part or tatue can choose designs that combine with each other. 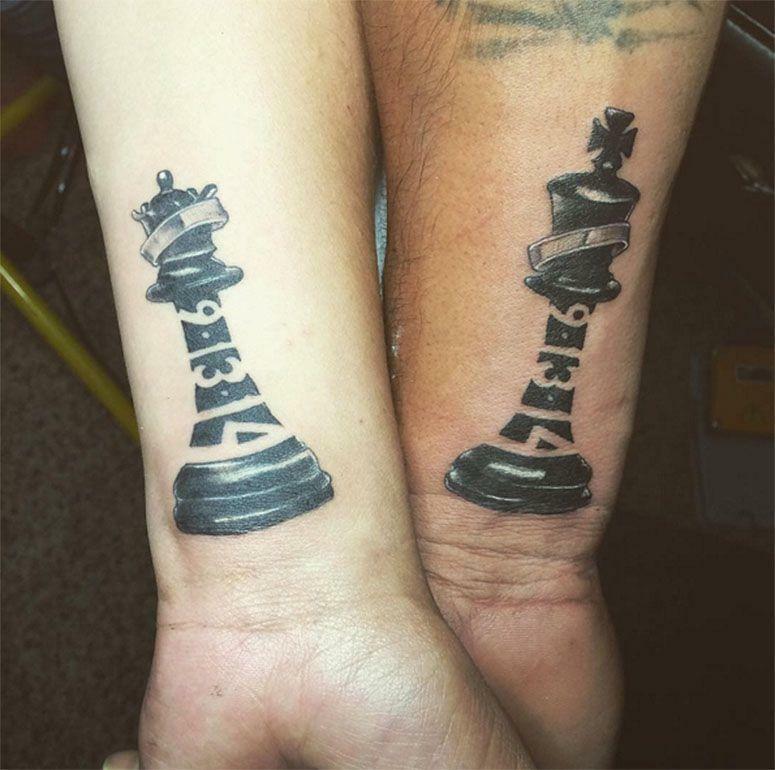 animal couples, archery, sun and moon, puzzle pieces, pairs of playing cards and chess pieces are some of the most popular options. 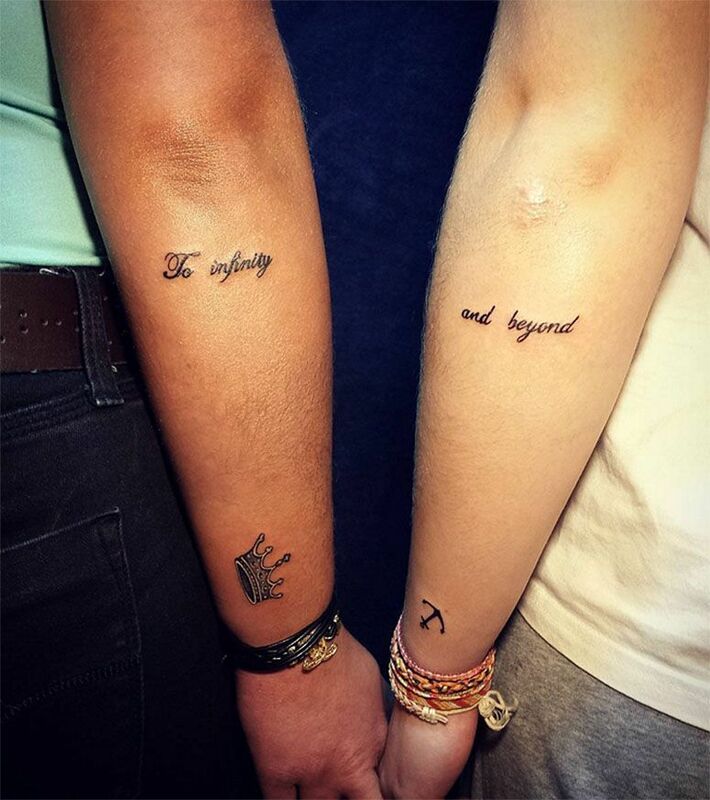 Far beyond the names, to decide to make written tattoos you can choose a special date a piece of music, books and quote movie lines. 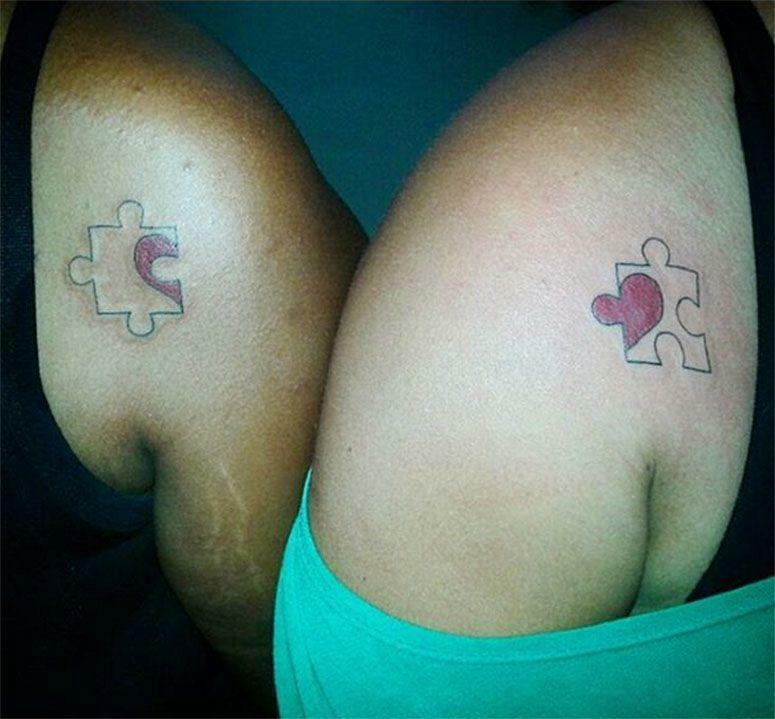 Anyway, any word or phrase that has an important meaning for the couple is a valid idea. 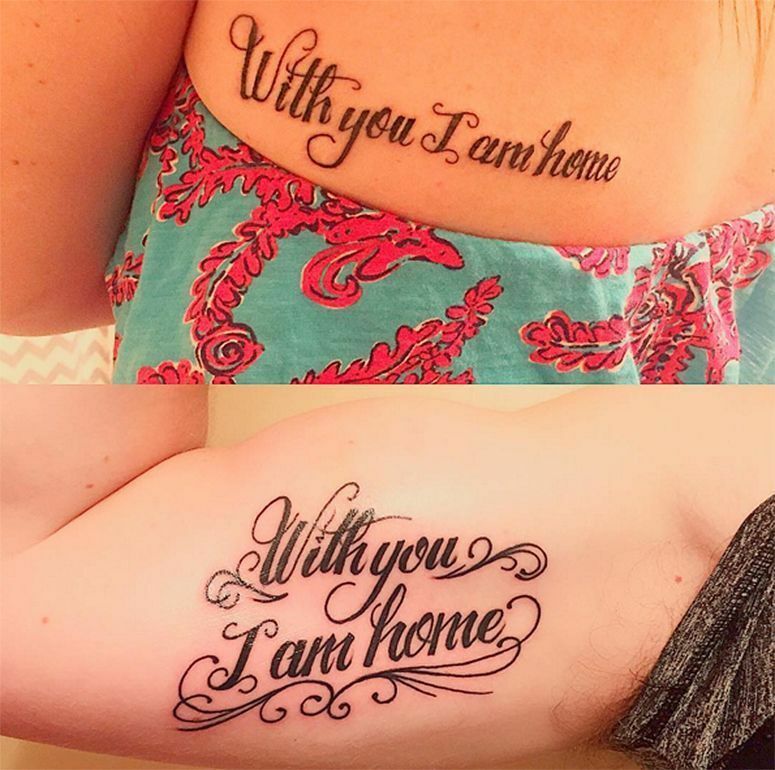 The phrase may be the same for both, or split to become complete together. 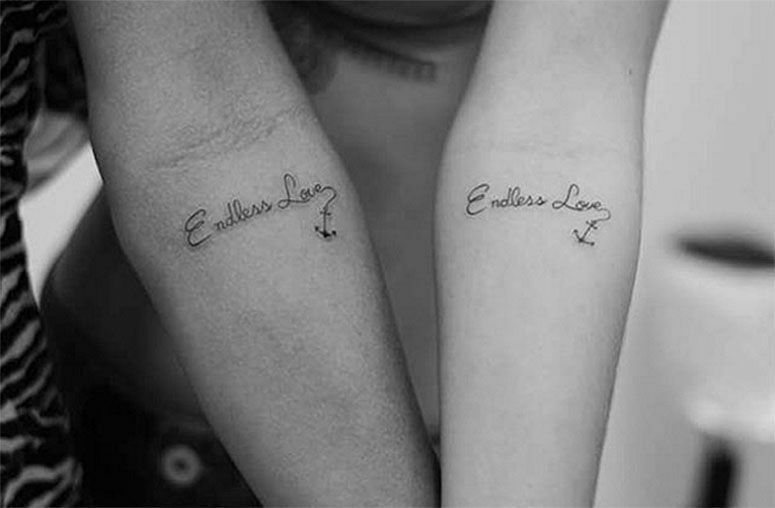 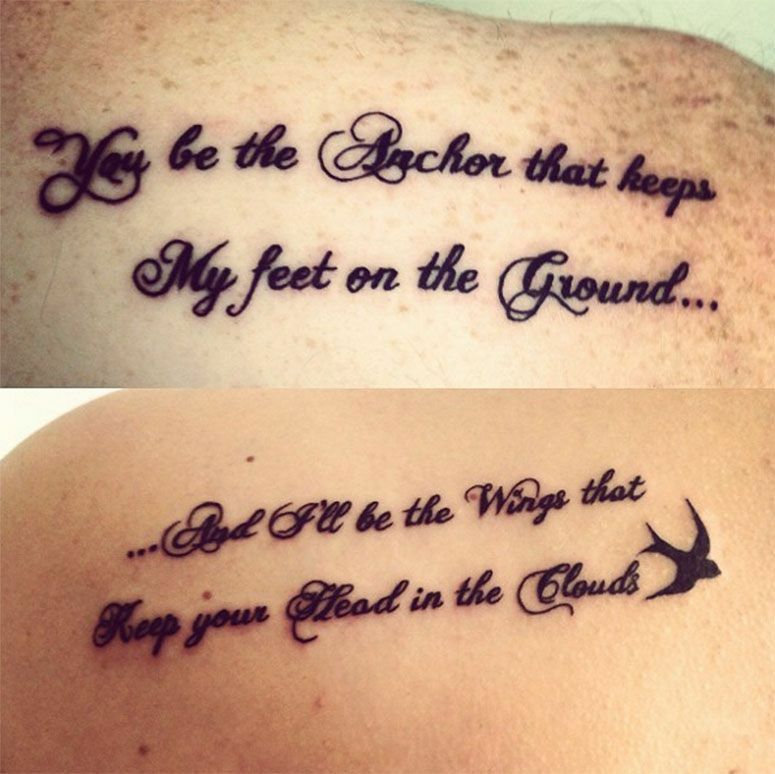 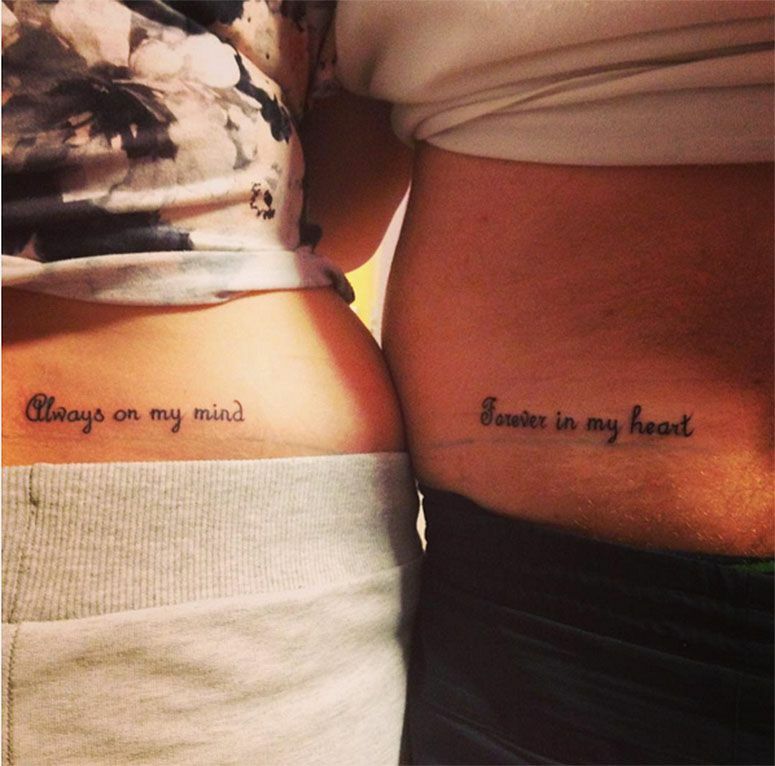 An idea to let that kind of tattoo even more personalized and intimate tattoo is the words with the letter of the couple. 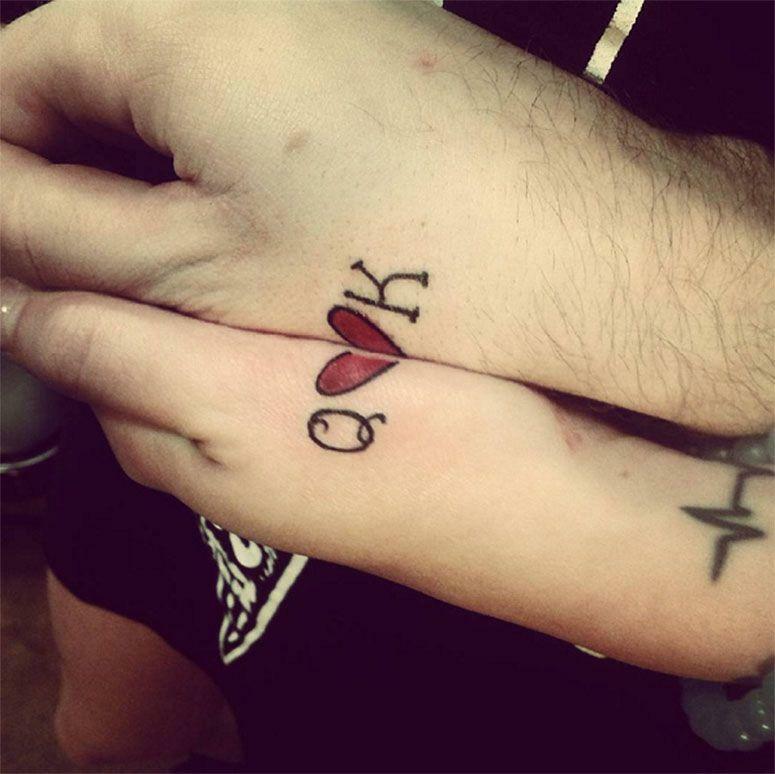 Thus, in addition to a word or phrase with a special meaning, it will be recorded in the letter of the loved one. 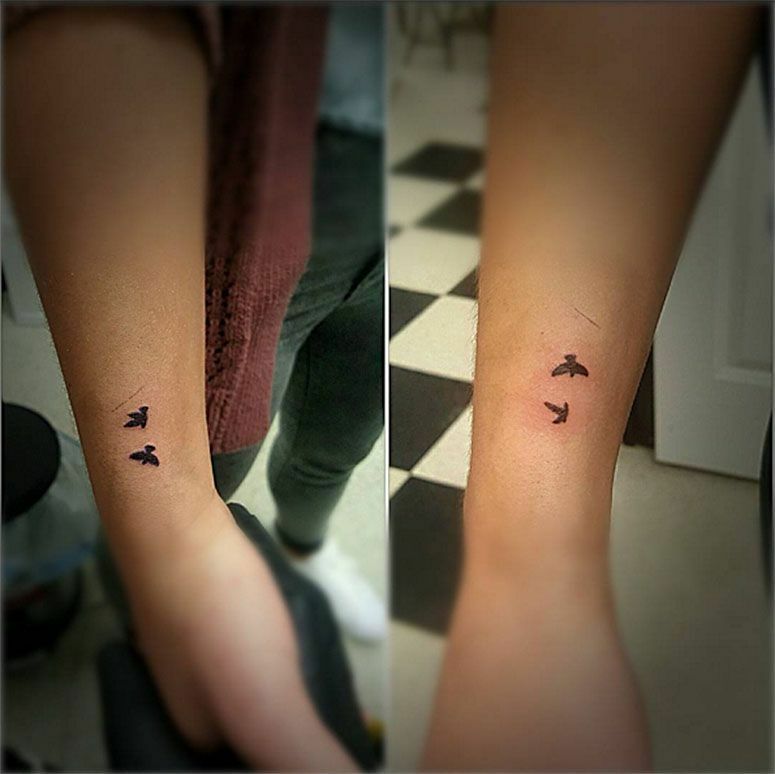 Those who prefer to opt for more discreet designs can identify more with the proposal of this type of tattoo. 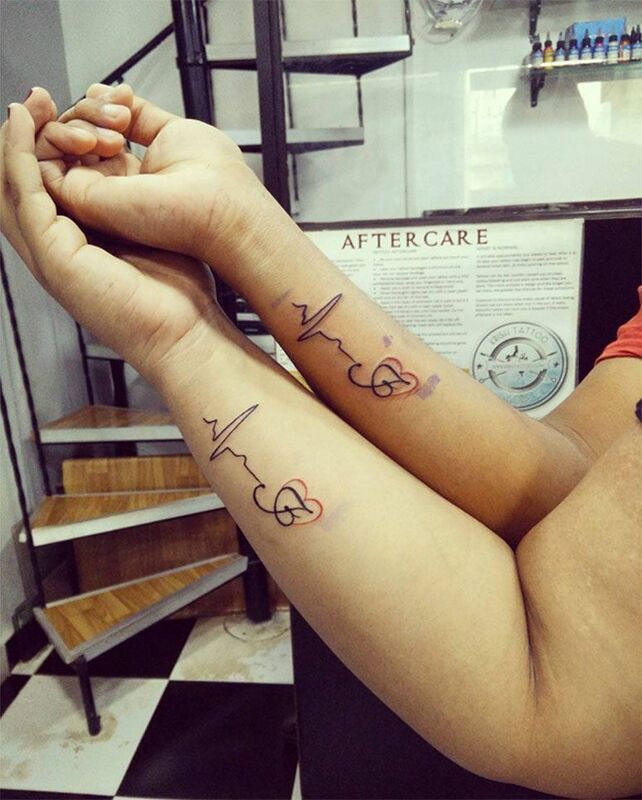 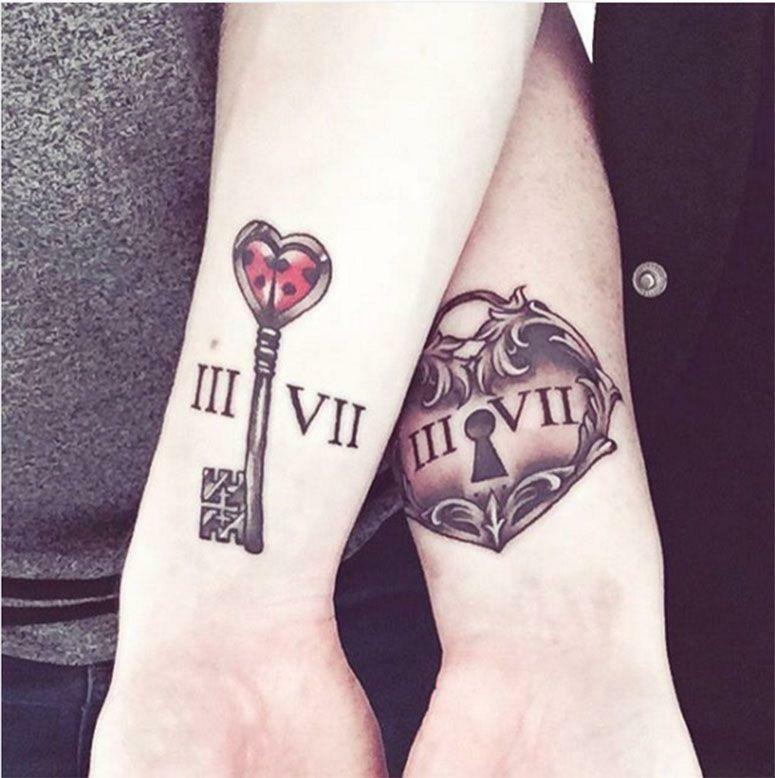 Here, choose a design that suits the couple and both tattooing the same. 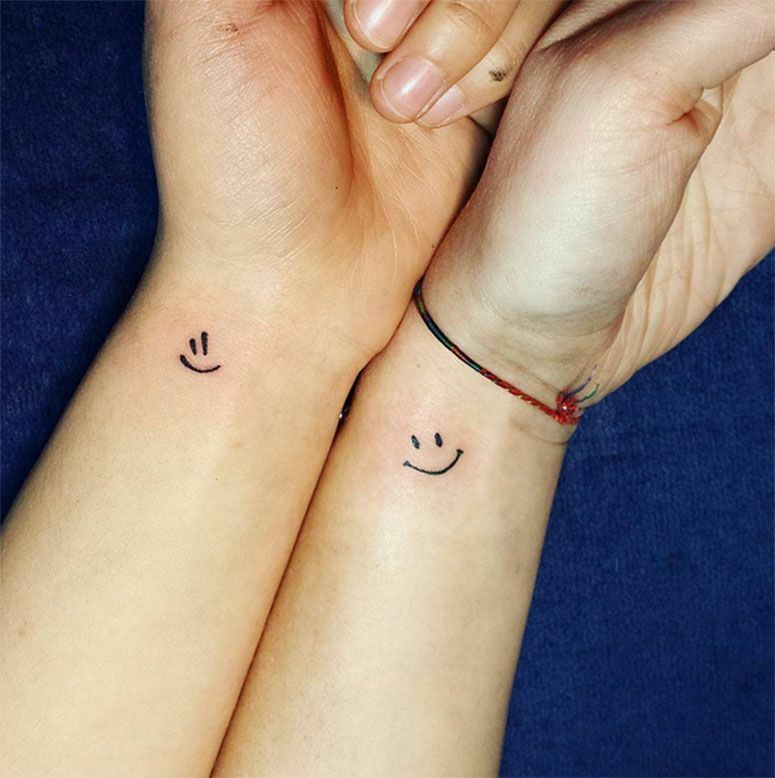 As it is not an alternative that leaves obvious that it is a double tattoo, it can be a good choice for those who do not want to commit to drawings which only become complete with the tattooed part of the other person. 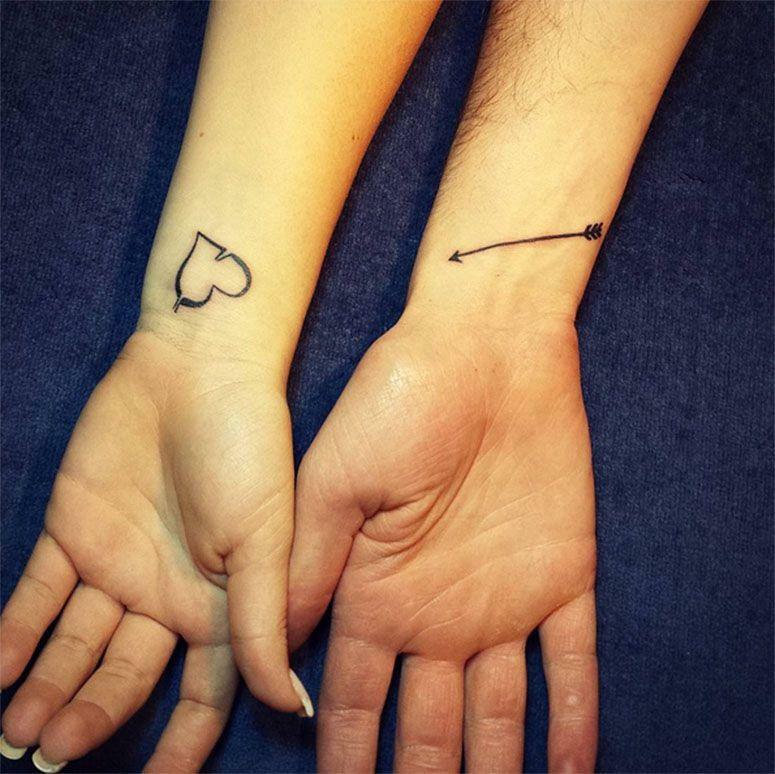 In choosing the location, there are no restrictions for the double tattoo and what prevails is the desire of each. 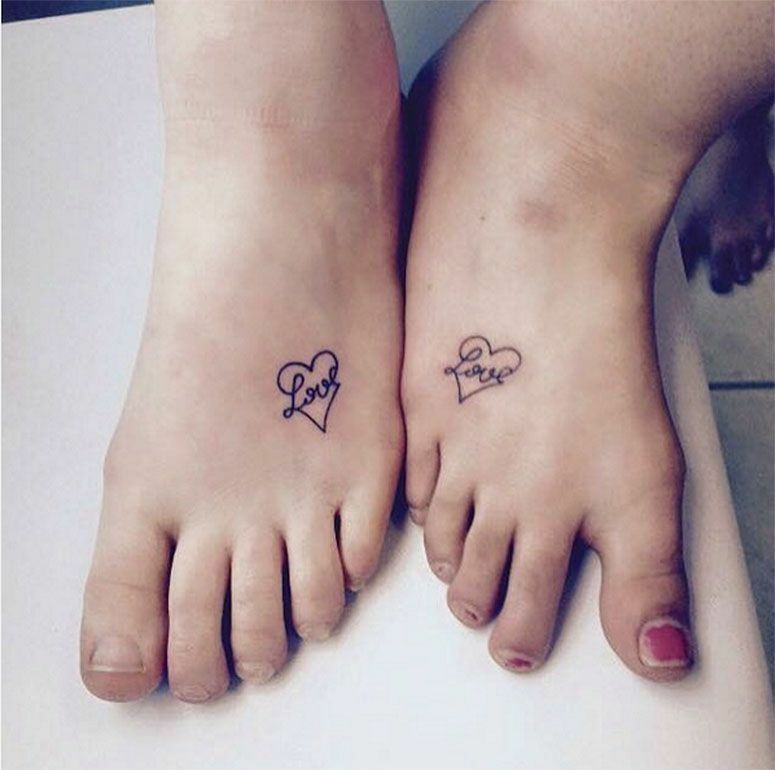 "From the big toe to the last strand of hair that matters is the intention of scoring a good time in the lives of these two people," says Gabriel. 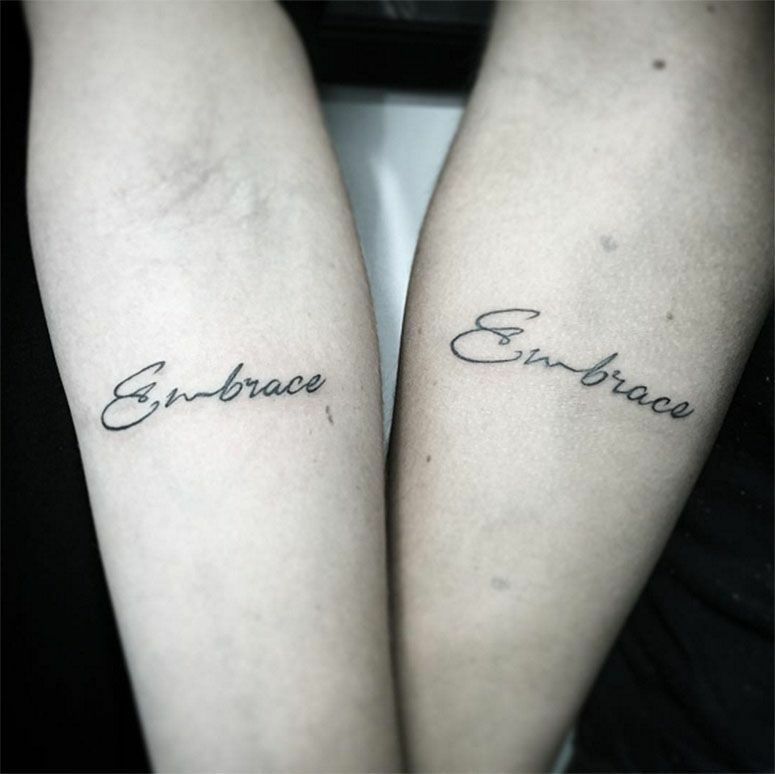 "The place depends greatly on the design, but usually wrists, forearms and ribs are the most chosen for phrases and names," added the artist. 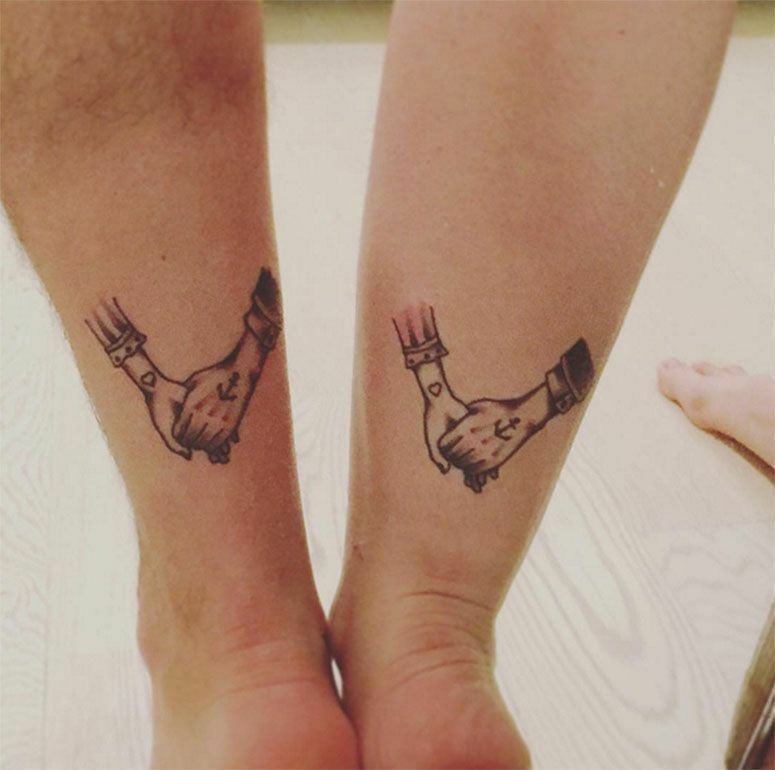 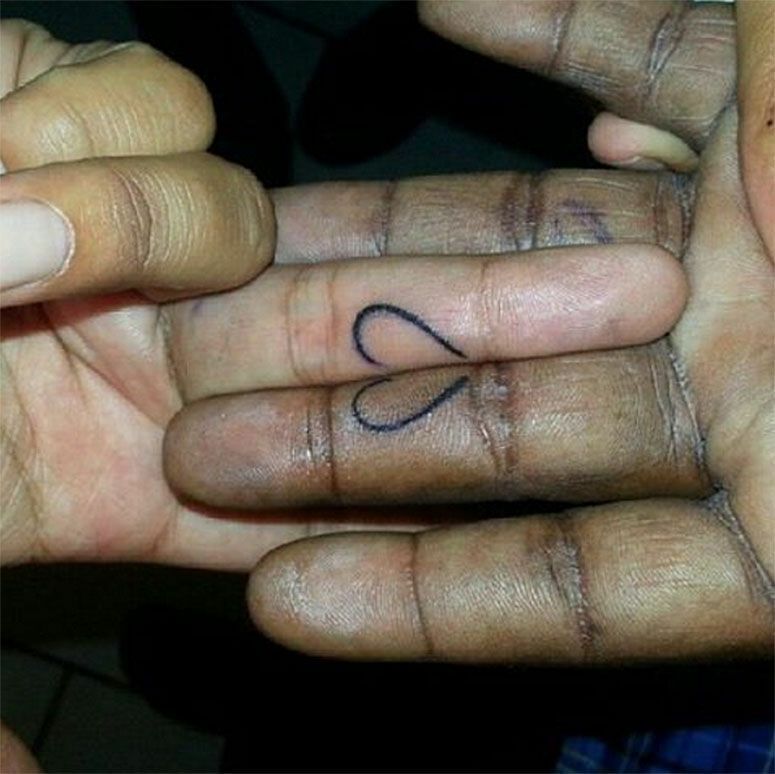 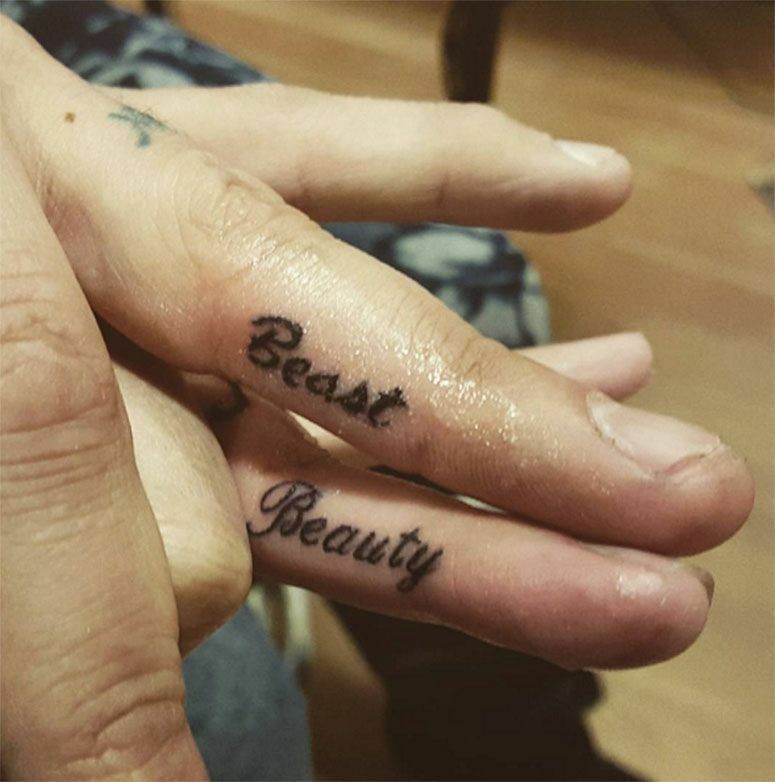 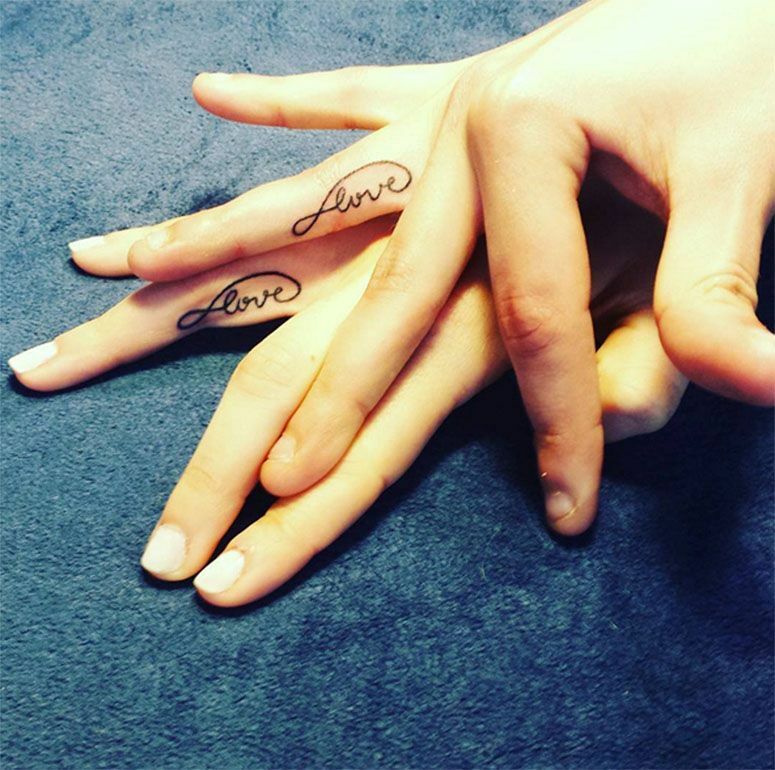 Tattoos on the fingers, replacing alliances are a nice option for those who chose drawings or small words. 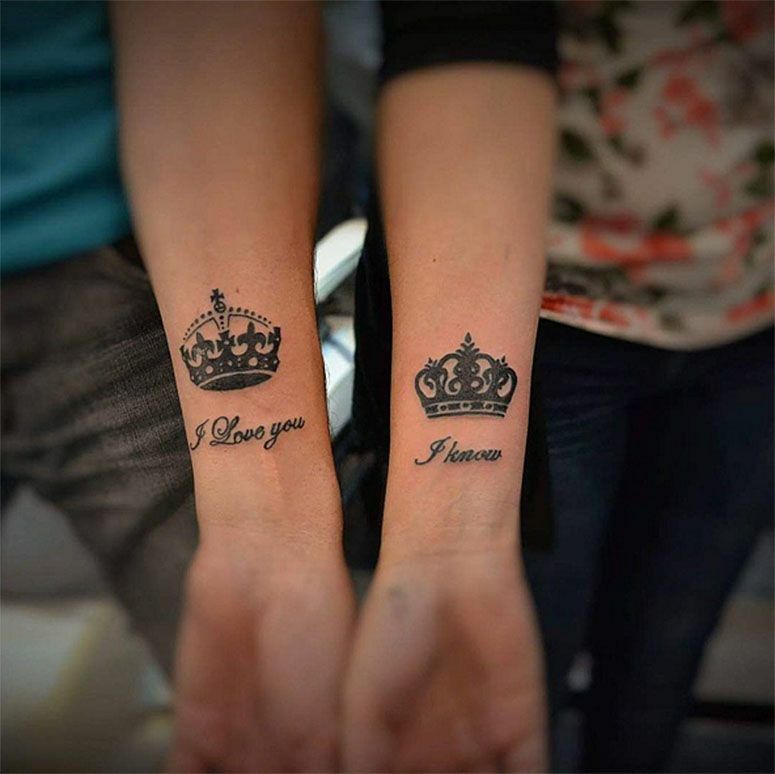 Hands and arms are popular choices for those who selected a design is completed, creating a nice effect. 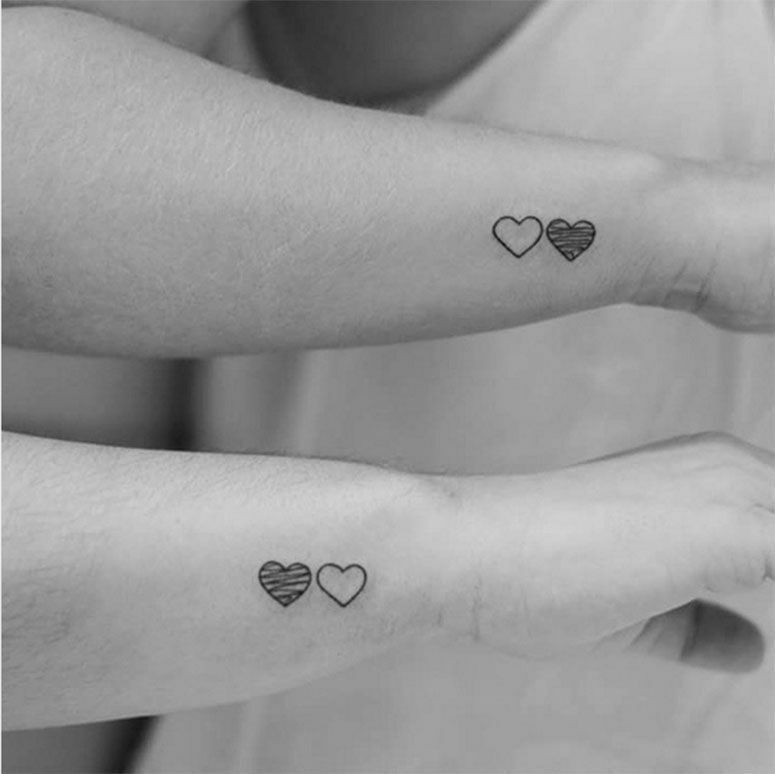 "The rib is an interesting place, or even chest toward the heart. 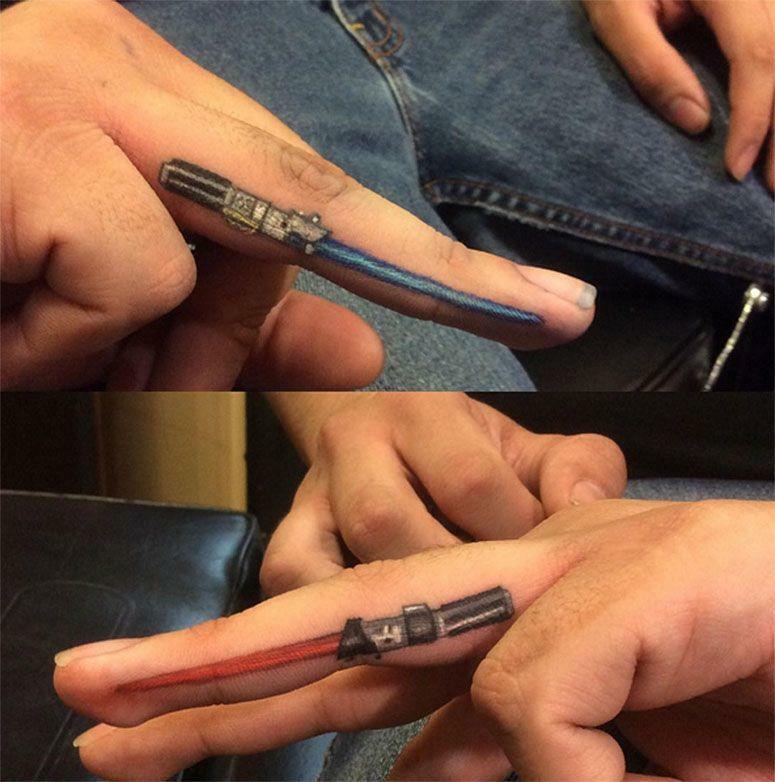 If the idea is to show everyone, tattoo fingers, as an alliance, it is also cool, "suggests Gonta Felix. 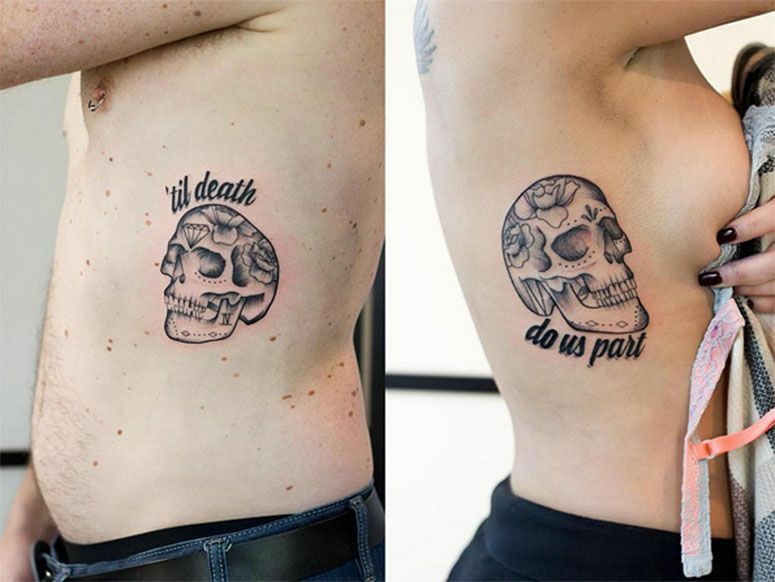 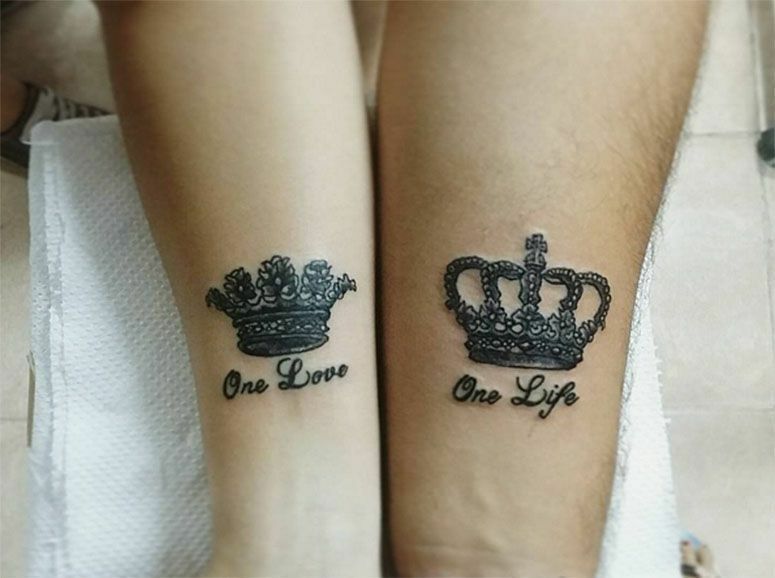 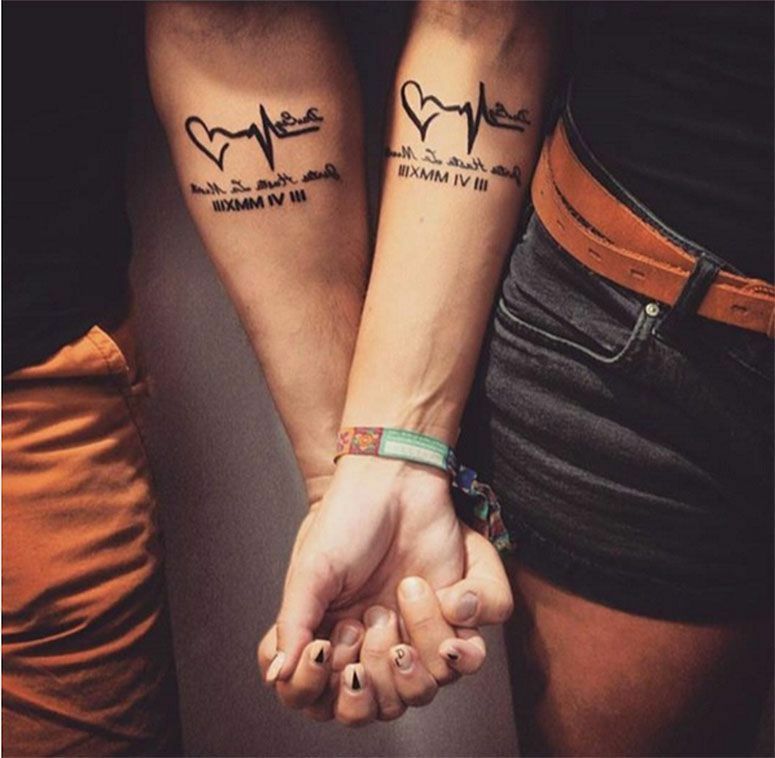 It is common that the site chosen for the tattoo is the same in two, but this is not a rule - the matching tattoos will still be special for the couple if they are made in different places. 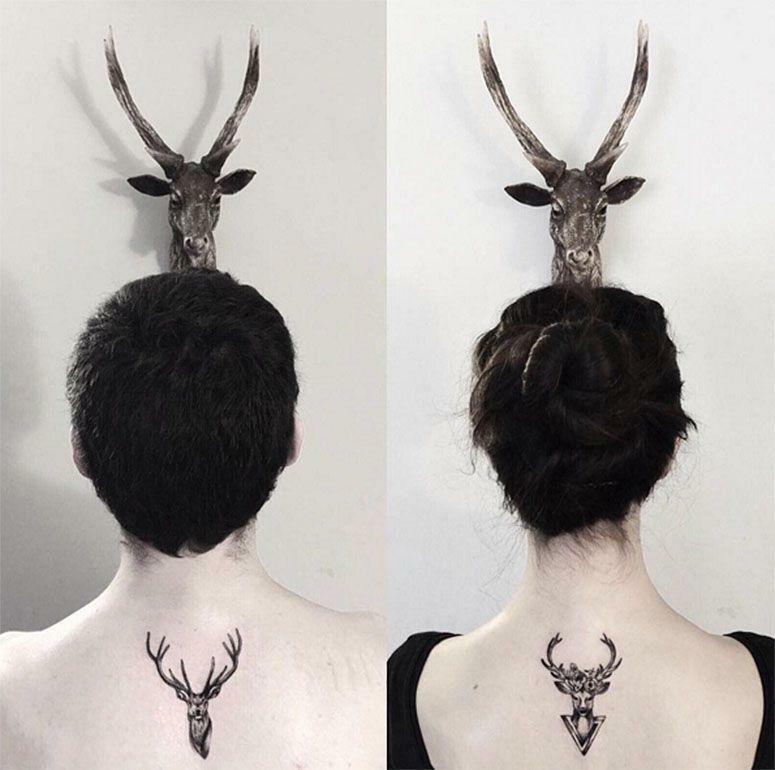 To achieve the perfect result, watch out the details. 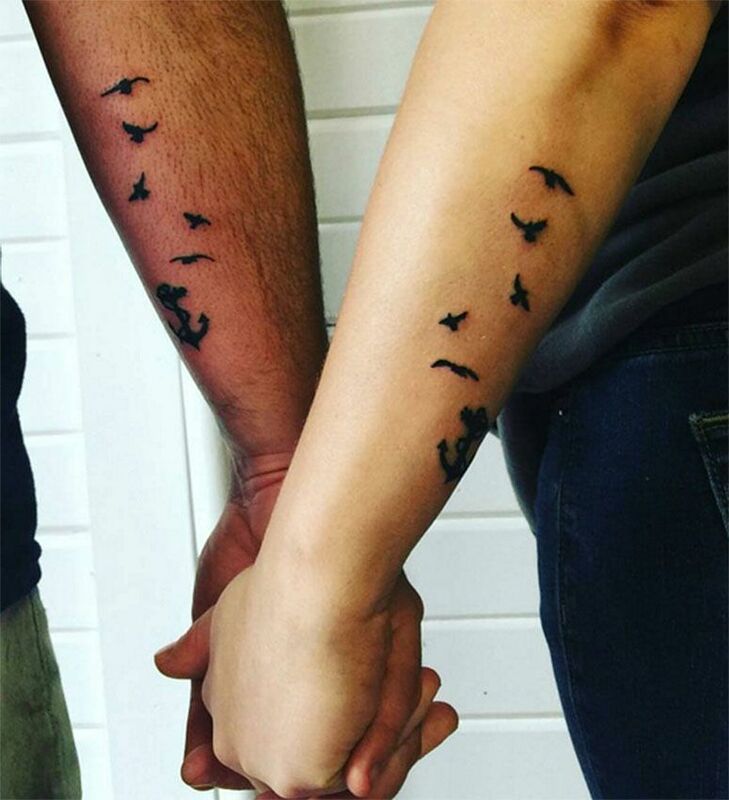 Search inspirations and think of the story of the relationship makes all the difference when the couple choose the tattoo design! 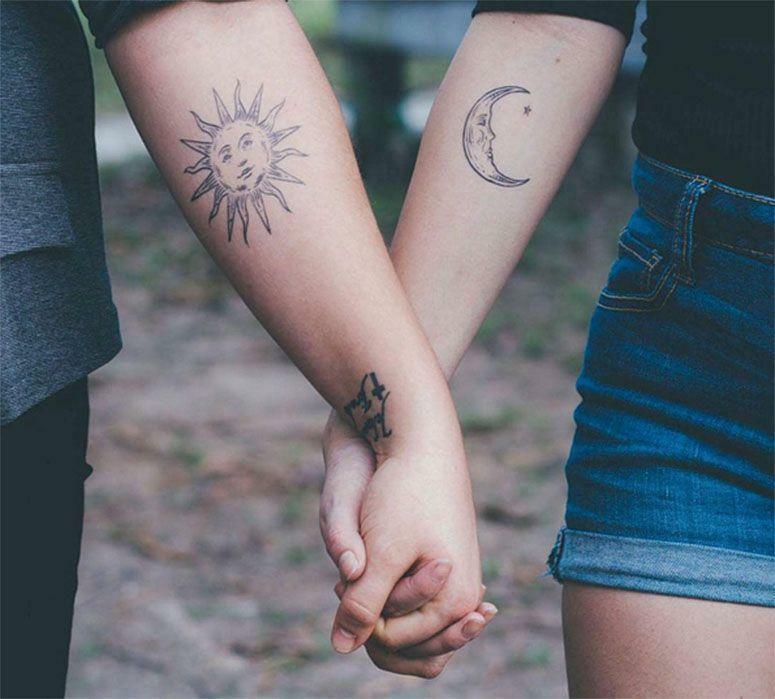 And who still has insecurities should think well before making a final decision. 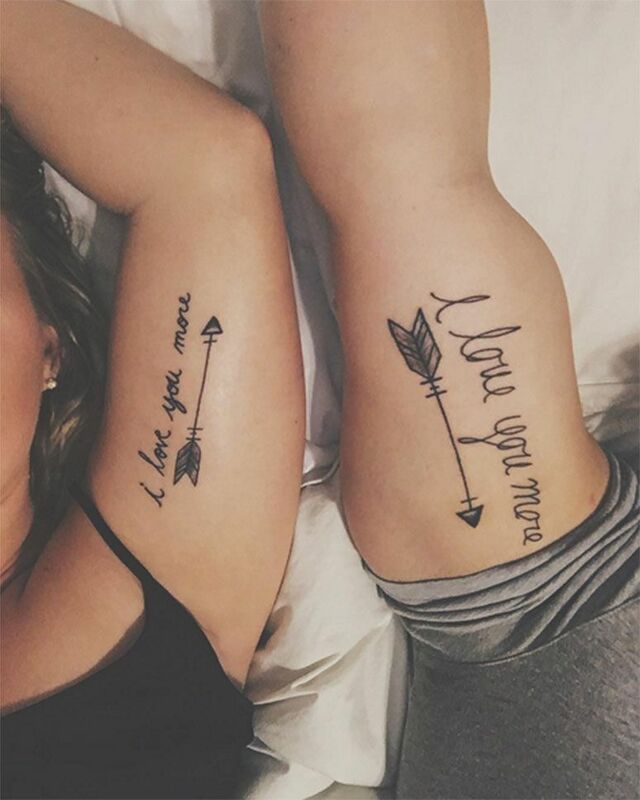 "We have to remember that the relationship is eternal while it lasts, honor a person with a tattoo is pretty cool, but we have to make sure our intention and then not regret or have problems with a new relationship," concluded Gabriel.